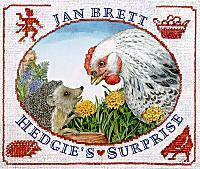 Pen Pals & Picture Books: Surprise, Hedgie Style! 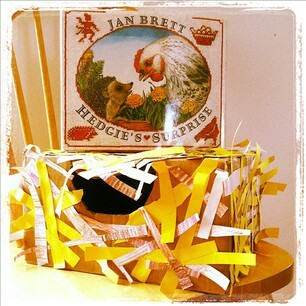 In this book the naughty Tomten keeps stealing Henny's eggs. But, with Hedgie's help, Henny is able to foil the little Tomten and his rotten plans! So, of course the book has fantastic illustrations, great little animal interactions, and then there is a fun little trick at the end! We love it! First you get a box and cut the top flaps off. You're going to turn it upside down so it's hollow under there. Then you need to cut a hole somewhere in the box for the kids to reach in and feel the items. It should be strategically placed, so they can't look in while they are reaching in. I went with a flap, instead of an open hole, but you can do whatever. This next step is totally optional! We decorated our box to look like a nest, but you wouldn't have to do anything to the box at all. 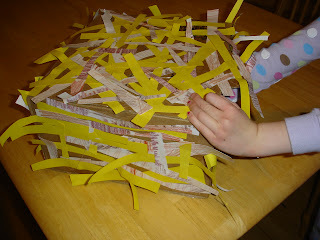 The point is the sensory activity, cutting and gluing is just a bonus. 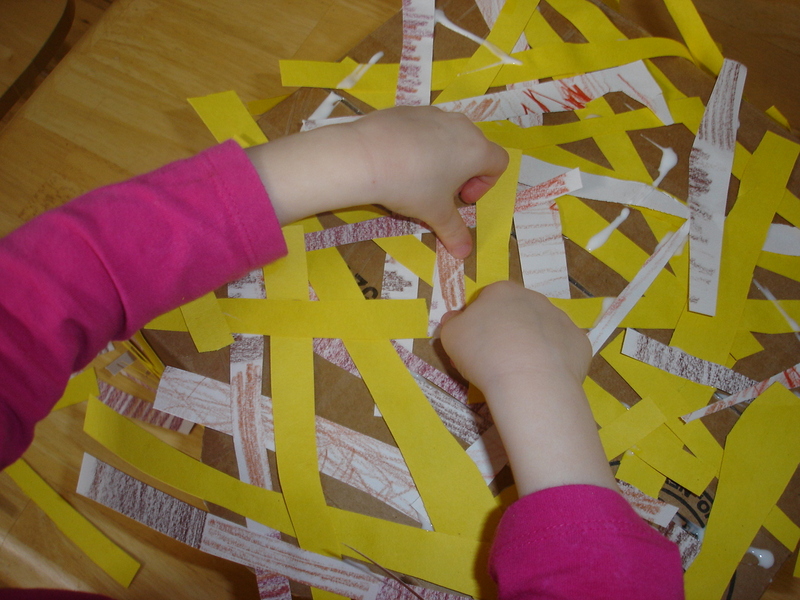 Then I squirted some strips of glue randomly and we stuck our cut paper on. 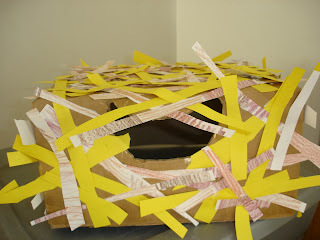 We just worked our way around the box, again, just for the fun of gluing and sticking. Below is the finished product! I kind of love it. It's so cute and nesty! We let it dry and then the real fun began. 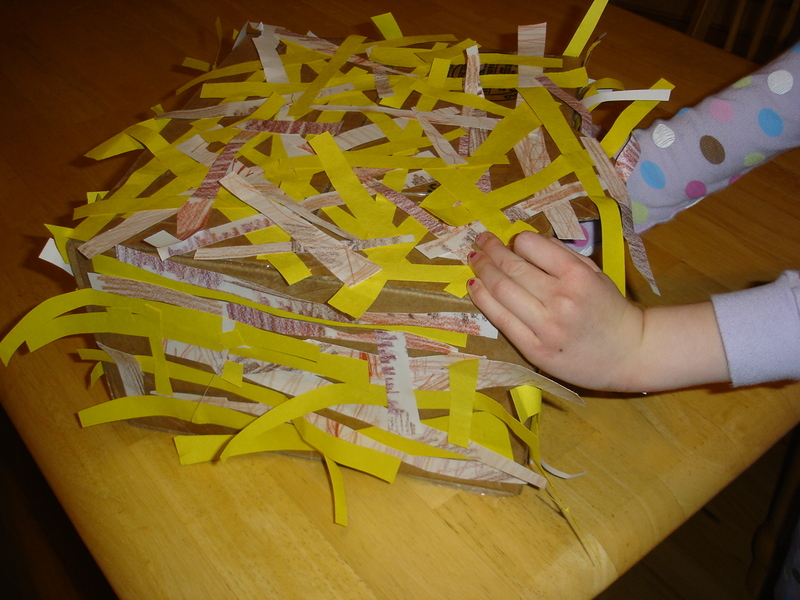 The feely box is a chance for kids to focus solely on the sense of touch. You put an item in and they reach in and try to guess what's in there by feeling the item. FYI this is hard for preschoolers. Mine kept trying to pull the item out and look at it instead of feeling it to try to figure out what it was. But, after a few tries we convinced her that the fun is in the surprise. 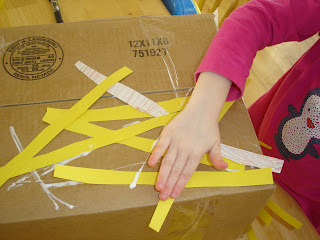 You can put anything in the box--- we used different stuff from around the house (matchbox car, comb, kitchen sponge, a spoon, etc). Also, this activity was great for all ages! I even put stuff in for my toddler that I knew she could recognize by feel and it was so cute to hear her little toddler voice figure out what each item was. As soon as my school aged child found out what the nest was for, she immediately asked if the stuff in the box was going to be the stuff from the book, like a potato, mushroom, strawberry-- which would have been so so fun, but we didn't have all that stuff. Textures would be really cool too (like rough sand paper, soft cotton balls, maybe feathers). You could go anywhere with it! My kids loved this so much that they played with it on their own the next day too. One child would put something in the box that they hoped would stump the other child, and vice versa. And there was no fighting about it! They just took turns! Amazing right? 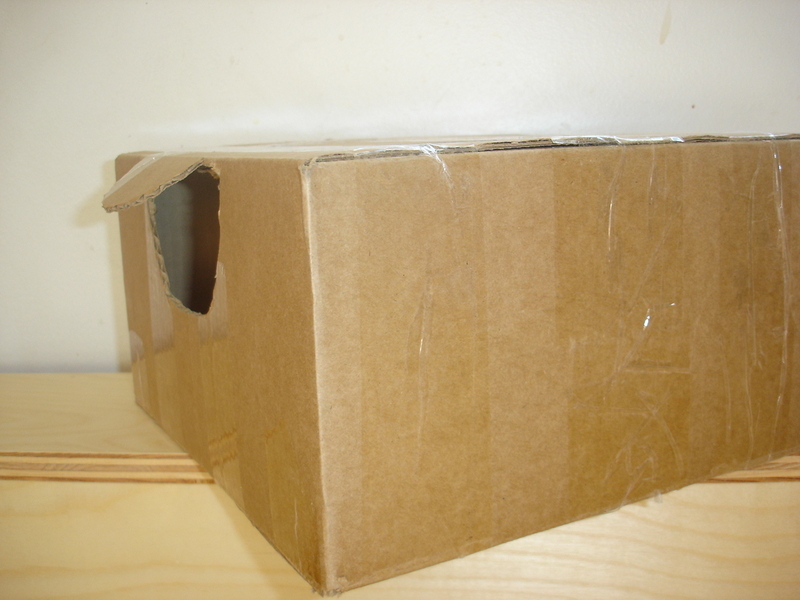 The power of a cardboard box! Happy reading and happy feeling! You can find this post skid-a-merinky- dinky- linked at the Kids Co-op!